Well, as I may have mentioned before, I'm off to Italy next week for a residency with the Jerusalem Studio School summer programme. 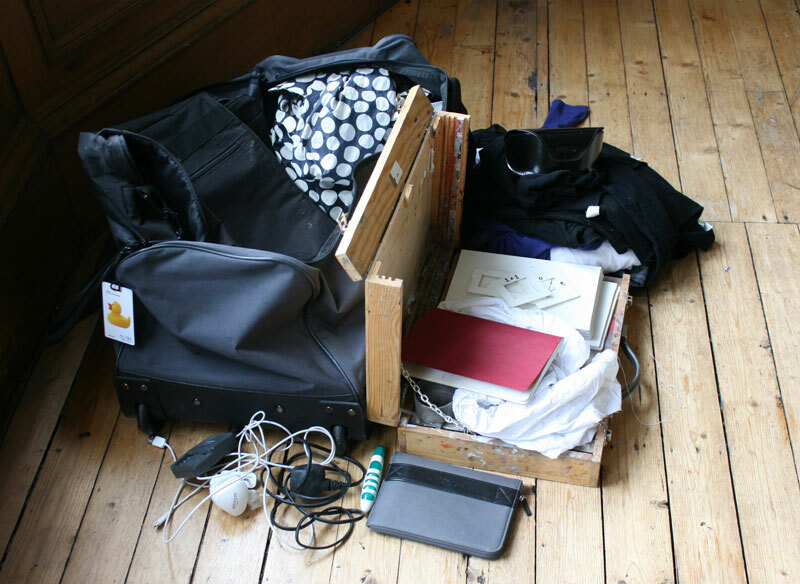 Being both an organised (ish) type, and super busy this coming week, I have started packing today - the above shows what I am taking, minus the laptop and the camera. Inside the suitcase, along the bottom, is about 20 prepared panels - I just hope they are enough. So far it weighs about 15 kilos, so will be able to acquire a few bits and bobs while I'm there. I had a bit of a hard time of it coming back from New York - I hadn't realised the monday I was flying back was a bank holiday, and I therefore pretty much had to carry a lot more than I had planned to - as the post office was shut. My suitcase then was right at the limit of 23kg - plus a laptop bag and an overnight bag carried as hand luggage. The total weight must have been close to half my weight . . . an experience I will be glad not to repeat. This time around I am wanting to really focus on oil painting. Over the last few wee while I have been playing around with limited palettes and I have narrowed it down to 23 colours - still quite a range! - and will buy titanium white once I'm there. My pochade box, which has a small palette inside. As the shoulder surgery was fairly recent I am planning on sitting on the ground most of the time - so I don't have an easel. Turps and oil will be provided by JSS - which is just as well as you can't take them on flights anyway - Making A Mark has a useful page about transporting art materials. My fountain pen is going and I am thinking about taking along some charcoal as well as watercolour pans or tubes and pencils for making tonal studies - these, along with a waterbrush, are very transportable and can be used in the moleskin. So, what else am I taking? Behind the box is all the clothes that are going - including a very large man's shirt with inbuilt UV protection that I am planning on painting in. There are some advantages to being short! There is a huge sunhat as well - and I'll buy loads of sunscreen once I'm there. The spotty thing is a very lightweight raincoat - I've learnt that sunshine means thunder storms . . . The only shoes are two pairs of nike free TR fit shoes - shocking pink and black - which are the most comfy, blister-free shoes I've ever had. Sadly, there are no heels. None. The Kindle is a must - as is my shuffle and a trusty moleskin or two - I love these, as they function as a diary, a place to write lists and details of hotels/phone numbers etc and a place to draw both when waiting and more formally. Pretty much everything else will be bought over there (including, probably, a kettle so I can make a brew). So, have I missed anything? Any advice?